The Tow Truck is my largest creation -period. It has 14 RC functions and weighs over 12 pounds. 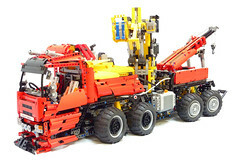 It was entered into the Lego Technic Challenge and made it into the Top 10... Read more!